Wailing soul: As corrupt as the music industry may be, Bunny Wailer found Jamaican politics to be far worse. Neville "Bunny" Livingston and Robert Nesta Marley were boyhood pals who essentially became brothers when their single parents moved in together. The family relocated from the village of Nine Miles to Kingston's rough-and-tumble Trenchtown--so named because it was built along a sewage ditch. As fate would have it, they ended up just around the corner from Jamaican pop singer and devoted Rasta Joe Higgs, who was giving neighborhood kids free vocal lessons in his Third Street tenement yard. It was there that Neville and Robert met up with Hubert Winston McIntosh and as Bunny Wailer, Bob Marley and Peter Tosh--the Wailers--became the holy trinity of reggae music. But while the Wailers' music has proven to be immortal, Bunny Wailer remains the sole survivor of that timeless trio and, ironically, the least well known outside Jamaica. After the group disbanded, Marley's popularity continued to grow, while Tosh consorted with Mick Jagger and toured heavily with Sly & Robbie. But Bunny Wailer turned his back on touring and stayed home in Jamaica, where he recorded a series of solo albums, beginning with the stunning Black Heart Man, that were frequently brilliant but seldom achieved the popular recognition they deserved. All of which makes Bunny Wailer's return to active touring--last fall with Ziggy and Stephen Marley and now headlining this week's Santa Cruz Dayz festival at the Civic--particularly gratifying. 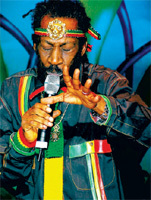 Wailer, who will turn 60 in April, is still an incredible performer and impassioned populist. Metro Santa Cruz spent an hour last week talking to Bunny Wailer about music and Marley, pot and politics, and a few surprises along the way. METRO SANTA CRUZ: You've done a few albums of Bob Marley songs, and the two-day festival that you're headlining is a tribute to him. Tell me what kind of feeling you get recording and playing his songs these days? Bunny Wailer: Well, the thing about it is that a lot of people use Bob Marley's name and go around pretending--but when it comes to really giving Bob Marley the true respect that he deserves, I haven't seen that emphasized in the way that I know it should be. So when I take time out to do Bob's songs, it's to actually pay my respects to Bob, saluting and making sure that his songs and his messages are heard in all ears--coming from him and coming from myself as one who respects him. And I find it a pleasure to sing Bob's songs. So I've been doing that in order to make sure that his name also appears on the Grammys that I have been awarded singing his songs. You know, he had passed before the time of the Grammys coming into existence. [Editor's note: Marley died in 1981, four years before the Grammys introduced their first reggae category.] But by singing his songs, his name is mentioned on my trophy as "Bunny Wailer: Tribute to Bob Marley." You two were so close growing up, really you were like stepbrothers. Do you still feel like he's with you? Yeah. You know, that's something that you can't be parted from. Yeah. Yeah, Joe Higgs was responsible for some of the tutoring that related to the Wailers' musical development. And that's where you met Peter Tosh? Yeah, we met Peter in Trenchtown. But you and Bob had gone back even earlier than that. Yeah, we were actually family from the age of about 9 and 11. And what do you remember about Higgs' lessons. He taught for free out of his yard, right? Yes, it was a voluntary effort to see to it that the Wailers were on the right track musically and as far as group and technique and harmonies were concerned. Joe Higgs played a very serious role in the development of those areas, and he did it voluntarily. Your daughter was telling me that you've started a school. So you're teaching now? Yeah, well , I'm not actually teaching, but I'm the proprietor of a school that holds kindergarten and prep pupils from age 3 to 12. Oh, it's the Solomonic All Saints Kindergarten and Preparatory College. Maybe about a year now. We are doing preschool right now. We are putting in infrastructures and we are actually starting with a couple of students already to get a feeling of what's happening and what should be happening, so that we can develop from that stage. But it's happening. We're getting there. And what will be taught there? Well the regular curriculums, and I'm including some African language, culture history. When I listen to your first solo album, 'Black Heart Man,' it's amazing to me that a song like 'Dreamland' (which Bunny wrote for the Wailers and rerecorded on 'Black Heart Man' with Tosh and Marley helping out), it's hard to believe you recorded that 30 years ago. Do you get much chance to listen to your old records? Yeah, but you know, sometimes you're listening more to the sound of silence, trying to put some noise to it. Family legacy: Bunny Wailer is finishing up three simultaneous new albums, while his daughter, Cen-C, prepares to release a debut album of her own. You used synthesizers early on. How do you feel about musical technology these days? Well, we try to maintain the original sound of the drum, bass and guitar, but at the same try to be with the stuff that's happening now. Because if you go to market, you have to go to market with what is required, based on what the people would want to buy and what the radio stations are playing ... while trying to bring out the authentic reggae music as should be expected from Bunny Wailer. And hope that the fans will gravitate to it. You also got into dancehall music early on. Yeah, but our age of dancehall was a little different from this age of dancehall. We have a new generation and they are improvising and putting forward their ideas in the dancehall. And so what I try to do, instead of shutting myself out from what they are doing, is to try to understand what they are doing and see if I can relate to it. And give it some kind of direction of some sort. Nowadays the dancehall does not suggest dancing with a partner, because there is more talking and rapping and all kinds of gimmicks happening, and that discourages the dancing people. So I've been working on projects that I would say are dancehall-related, to see if I can revolutionize the dancehall a bit in and bring it back to that. Much of your work has been very political. On your last album, 'Communication,' you have a track called 'Disarmament.' Can you tell me about that? That track is a speech by His Imperial Majesty [Haile Selassie] on the subject of disarmament. Like [the song] "War" that Bob did on his album, there was also a speech from His Imperial Majesty with regards to racism. That track is to speak to the world powers that they should understand the reason to disarm themselves, change their weapons of destruction into plowshares and pruning hooks. And study war no more. Now that was a speech he gave before United Nations, correct? How did the U.N. respond? Well, the U.N. responded favorably in the sense that it was coming from His Imperial Majesty. But, at the same time, like you know what happened when Mr. George Bush launched his thing, the United Nations advised him not to go about it the way he did, and they were shoved aside. So they were also shoved aside in the instance of their concerns in those speeches by His Imperial Majesty, that you shouldn't be making weapons of mass destruction. He had warned them if they continued on, they would have to answer to the Supreme Being, the power of creation. But they continue sailing off on their spaceship, miles from reality. They don't care for you and they don't care for me. So much trouble in the world. Well, you know, the voice of the people is the voice of The Almighty, so we can do something about it, if we all decide that we ought to do something about it. When the people who are affected decide that enough is enough and they put their feet down. It's all about the people. I mean, the army is from the people. And all of the politicians are also related to the people. With Jamaica's politics and all of what has happened in Jamaica, we have not learned any kind of a lesson to show that we are conscious and aware. And until we realize that and the people make a serious decision within themselves that could bring about a change, then we are still gonna be in trouble. But there's hope. The Jamaican Labor Party [which along with the less conservative People's National Party dominates JA politics in much the way the Democrats and Republicans do in the U.S.] used one of your songs without your permission. Well, they do that with a lot of artists. They did that also to me as an artist. At one point they used the song "Crucial." But "Crucial" was not really just a song; it was a statement that was related to what was taking place in Jamaica at the time. Well it's not about supporting a party. It's supporting the people's concern. If a party sees where they can get mileage by taking a song that relates to the people's concerns to motivate them into a situation that they can be victorious, then they should do the appropriate thing and realize that they are responsible to those people. But it still doesn't go that way. You know, guys get into power and then they abuse that power. In the '90s, you started your own United Progressive Party. What happened with that? Well you know it was a sad situation in that, I would say, I got caught up in so much things happening that didn't really fit into the progress and prosperity and development of the people. Based on the political parties that were administrating--the PNP and JLP--I thought maybe if there was a third choice. And all of that was a good idea. But then again, with the kind of dirty politics that had been happening, for me to get involved in that would have been a situation that, at the end of the day, would it be worth it? Because you might get yourself corrupted by the kind of filth that these guys are actually dealing out to the people, And so I decided not to go along with it. I got advice from some of the elders who thought that I was doing a good job the way I'd been going about it. So I'll just keep doing my politics my way. So which is more corrupt: the political arena or the music industry? Well, the music industry still has something to do with people's heart and soul. In the sense that as long as you can keep the sense from the nonsense, then you can come up with something that heals the mind, the heart and the soul. Part of your party's platform was decriminalization of marijuana. Does that remain a big concern for you? Very difficulty to smoke in that form though. All righty! But you see how much stuff I can do then? I can oil my skin shine. Yeaaah. And I can butter my bread. And I'm still gonna smoke. There you go! I f you were to go to Holland, you can go into the bars and you can get a drink of any form of booze, and those bars also got marijuana legally. Sold over the counter. Did you know that? Oh yes! [Laughs.] So what's the difference between being in Holland where you can buy it in the shop or in the bar, and then when you go on the plane and fly back to Jamaica, if you're caught with that little spliff you could be penalized and jailed. And that happened to you. So what really is it about? What about Holland that they do not see anything so dangerous that it has to be illegal, and what is it in Jamaica that makes the government of Jamaica seize it as illegal. That's very contrary and confusing, you know what I'm saying? And so the Rasta man has got to satisfy himself, you know, by just doing what he thinks is right, the use of herbs being a sacramental symbol of his worship under Irie I Selassie I, Jah Rastafari. You faced that in Jamaica, right? You were busted back in the '60s. I was busted and sent to prison. You know what is happening here? And you might not know this. Because you're just saying something a while ago that you gotta have proof of. Because if you went to the police department that shows records of people who have been penalized, you could never see one that shows that Bunny Wailer was sent to prison. So you'd better be careful of saying that, you understand what I'm saying? And you were just telling me that they busted you and that you spent time in prison. How long? I'm still there. Yeah, I'm constantly under surveillance, but I'm also constantly surveilling the people that have me under surveillance. Because as long as the damage is done is as long as you gotta pay for the damage. So if the consul of law did violate my rights and send me to prison without giving me the justice that I so deserve and violating every right that I do have as a human being, penalizing me and don't have any proof of my being guilty, then that's a serious crime against Bunny Wailer that could be very very touchy if the world should know the story behind all of that stuff. That would be more significant to be writing than to say Bunny Wailer was busted is to say that Bunny Wailer was falsely imprisoned, and that Bunny Wailer has in his power the right to defend himself and the Queen of England and Virginia and all the laws that govern violating Bunny Wailer's right, has got to answer to Bunny Wailer. That's what the story would say, in reality. So you were busted even though you didn't have anything on you. It's not about having anything on me. It's about not even being charged. All right, I'm gonna ask you a question. Can someone be imprisoned without even being charged? In America, we do that with people we say are terrorists in Gitmo. Oh, so maybe that's what happened to me. Because in those days, when you deal with ganga, you were maybe seen to be a terrorist. Because I was treated as a terrorist. Because I wasn't charged. Because there is no record to show that I was charged. There's no record to show that I was tried. But there's records to show that I was imprisoned. For 18 months. So all of that is happening, that somebody can be in prison and there is no record to show how he got to prison. There's no trial record to show that he was tried and convicted. The record shows that the case was withdrawn. That's what the record shows. And yet I went to prison. So if the case was withdrawn, how did I go to prison? Was it a vacation? I heard it said in a movie that the laws of Jamaica were written in pencil. During those 18 months, what did you do every day? Well, I just praised the Most High, the Selassie I, for each day--and just do what the prison required, and time saw me out of there. Your  'Communication' album is the last I've heard. Are you putting other stuff out in Jamaica? I've been in the studios, always recording, because I can't find myself having any idle moments. So I'm always making records, making songs, producing stuff, you know? So I've been working on several projects. I'm working on a crossover album called Cross Culture. I've been working on a rub-a-dub album, trying to see if I can bring back dancing to dancehall. And I'm working on an album that relates to the people's struggle called Unite. And I'm also working on an album with my daughter. A lot of people have yet to know that Bunny Wailer has a daughter that is now in music. Her name is Cen-C Wailer and she has an album coming soon that is called Contagious. So is your Solomonic label still going? Yeah, the album I'm telling you about is coming through Solomic, and we may be merging in the same way with [Marley's label] Tuff Gong. Some kind of Tuff Gong/Solomonic situation in the future. We're trying to merge both companies. And you also toured with Ziggy and Steven Marley last year. It's like things are coming full circle. Yeah, you know, the next generation. It's good that I'm here to be part of it.